Jules and Jim, that sounds familiar to your ears? Of course it does. Think Truffaut. Think Jeanne Moreau. And from now on think hotel, too. It’s not just any hotel; it’s the “place to be”. 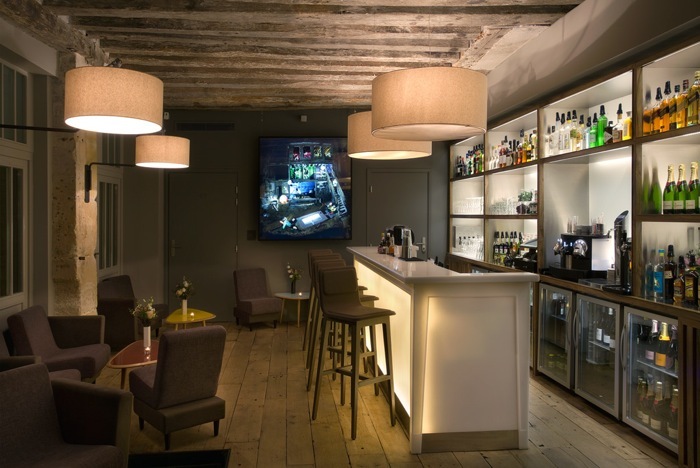 Jules & Jim is a very hip spot that just has opened its doors and is about to attract not only gay guys coming to spend a few days in the Marais, but also a straight clientele keen to experience Paris from an artsy and edgy angle. 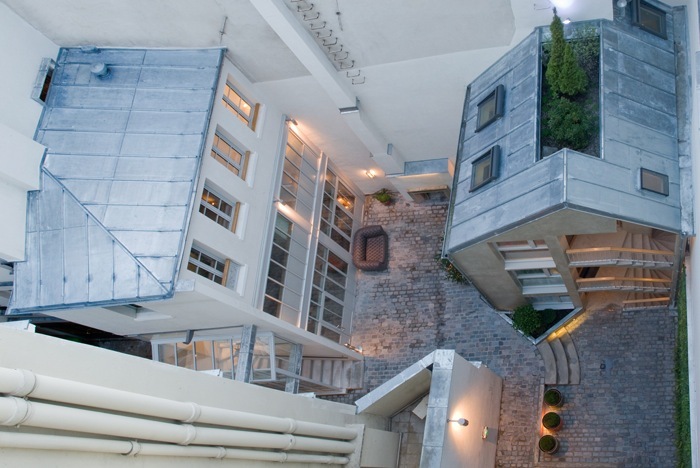 Imagine Jules & Jim like an urban village: located in the very heart of Paris, a five minutes walk from the George Pompidou Center, it consists of three buildings around two cobblestone courtyards. In one of the courtyards, believe it or not, an old outdoor fireplace is nestled where, during wintertime, a fire crackles every night. Jules & Jim is run by two associates who worked on the project for five years. One of them, Geoffroy Sciard, shows us around with contagious enthusiasm: Jules & Jim has 23 rooms with two different themes, some very sober and masculine, others like nice cocoons, more on the round side, more feminine, designed according to a very original concept: the centre is clad with a backlit composite shell housing a spacious bed. Facilities like bathroom, toilette or wardrobe are hidden in the four corners of the room. There are duplexes too, but my favourite rooms are definitely the two on the top floor of the main building. They are kind of small, ok, but each one has a tiny balcony and offers such a breathtaking view of Paris that you may be tempted not to leave your cocoon and just contemplate the beauty outside (allow 270 to 310 euros per night depending on the season). Geoffroy has thought of everything: the bar is modern but cosy, there are books in French and English. The barman, Raphael, is a master of his art, the soundtrack comes from Beatrice Ardisson, an authority in France when it comes to acoustic ambiance. The breakfast hours are much longer than you might be used to: on weekends, late risers can enjoy their croissants, fruit salads and other treats until 1 p.m.
You immediately feel a special mindset here. Jules & Jim is to the hotel business what effortless chic is to the fashion industry: cool, easy going and at the cutting edge.